Please refer to our stock # 649 when inquiring. 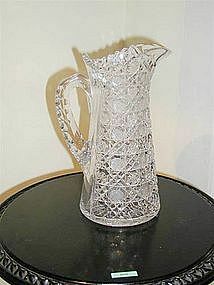 This large, brilliant, cut glass pitcher, measures 11" tall x 5 1/4" diameter on the bottom. I am not an expert on cut glass, but I know a good piece when I see it, and this is one of them. Although I cannot find a signature, I'm sure the pattern will be identifiable to an expert who knows their patterns. There are a couple of very minor flakes at the top, otherwise in perfect condition.